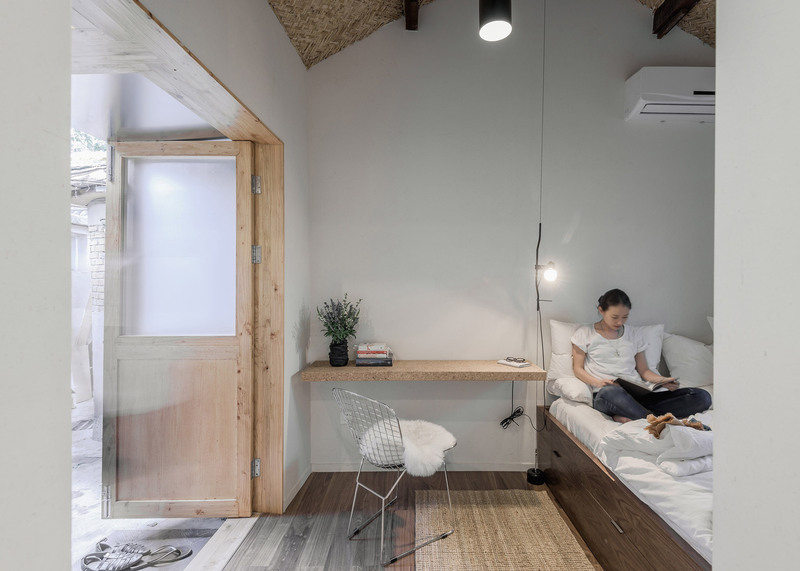 Office AIO has converted a courtyard residence in Beijing's Xiang'er Hutong into a tiny cork- and tile-lined coffee bar with a traditionally styled guest room (+ slideshow). 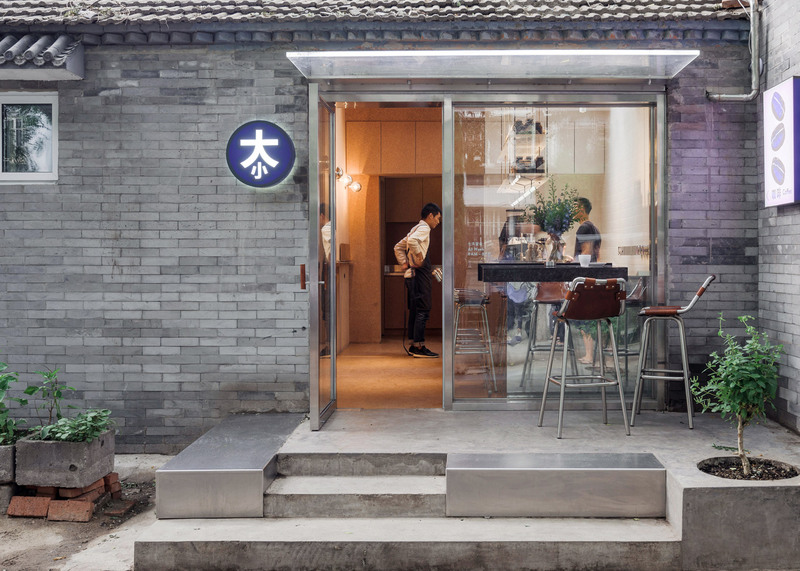 The tiny 34-square-metre business named Big Small Coffee + B&B is set within one of Beijing's hutong districts, which consist of high-density houses set along narrow alleys and around courtyards. 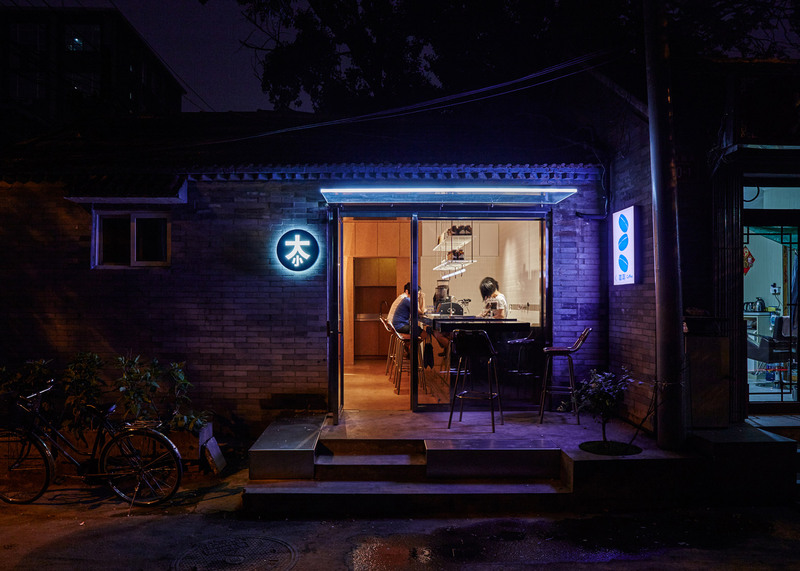 Office AIO founders Timothy Kwan and Isabelle Sun divided the space into two parts – a 19-square-metre coffee bar and a guest room measuring 15 square metres – linked by a courtyard shared with an elderly neighbour. "The owners of the coffee business wanted to bring serious artesian coffee to their customers in a small space, emphasising focus on just a good cup of coffee," said Kwan and Sun. "Hence the brand Big Small Coffee – being small in size but big on intention." 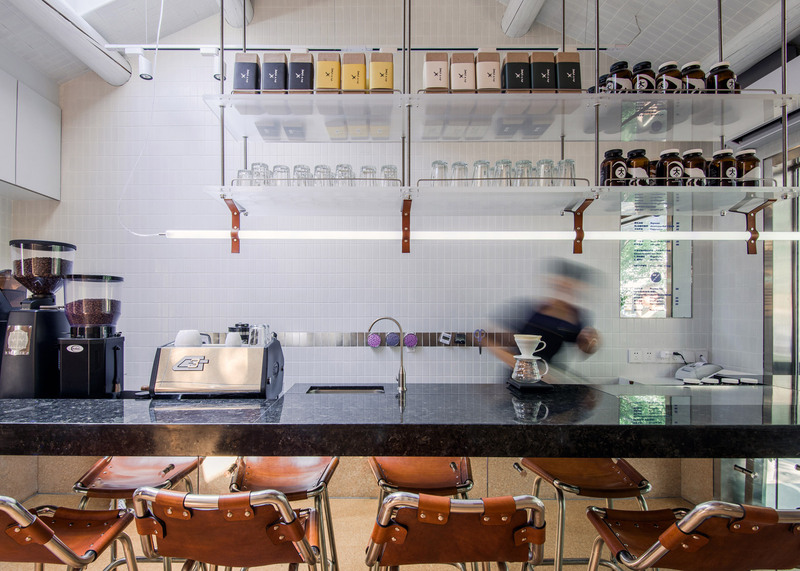 The coffee shop is split lengthwise by a mirror-clad bar topped by a slab of shimmering granite. The granite counter top passes through a slot in the glass shop front to provide a small outdoor seating area sheltered by a clear acrylic canopy. 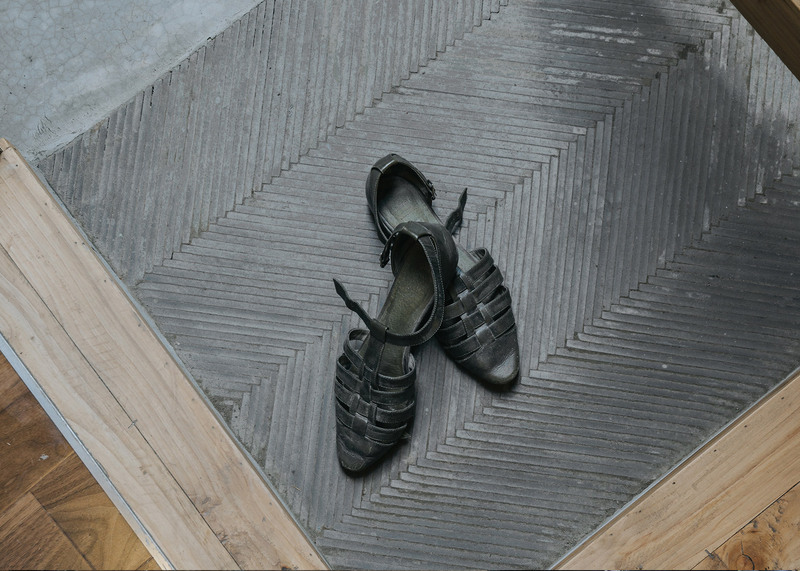 "The gesture also serves to dissolve the envelop in between the interior and the hutong scenes," said the architects, who added a pair of metal blocks to provide further impromptu seating outside. 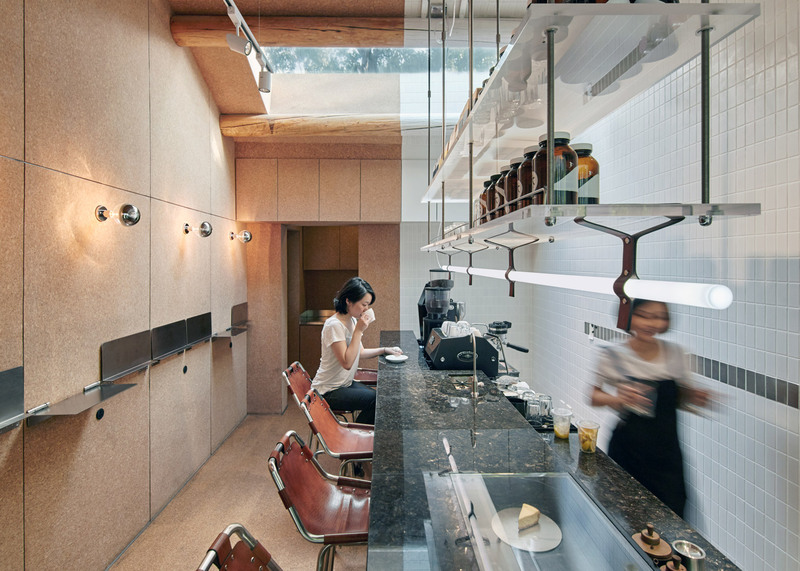 While the barista's realm is covered in small white tiles that give it a sterile appearance, on the other side of the bar the seating area is lined in tactile cork panels. "The small white butcher tiles scale the space, and are a timeless, versatile, bright backdrop," said the architects. "The cork panels on the other hand are warm and inviting to the touch. It is also a sound absorber, making it an ideal choice of material in the context of a co-shared wall with the neighbouring living space." 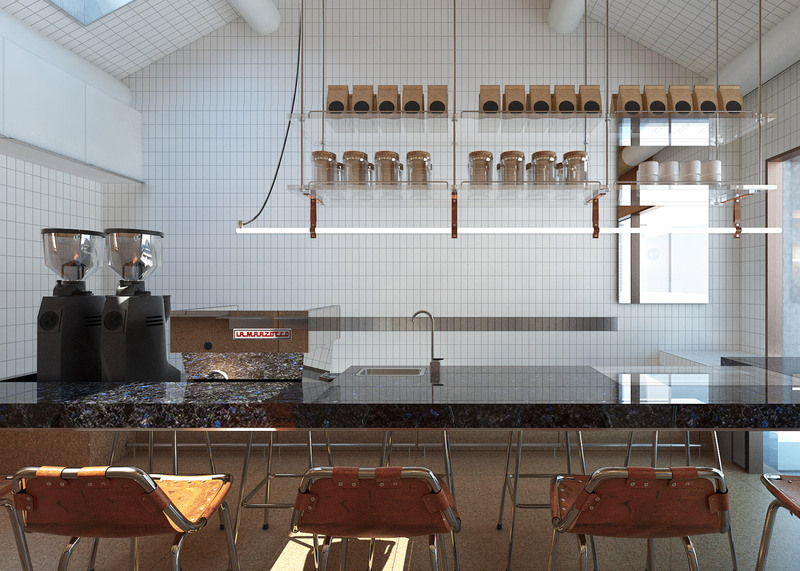 Small tools are affixed with magnets to the wall behind the bar, while larger objects are displayed on a clear acrylic shelving unit suspended above the granite counter. 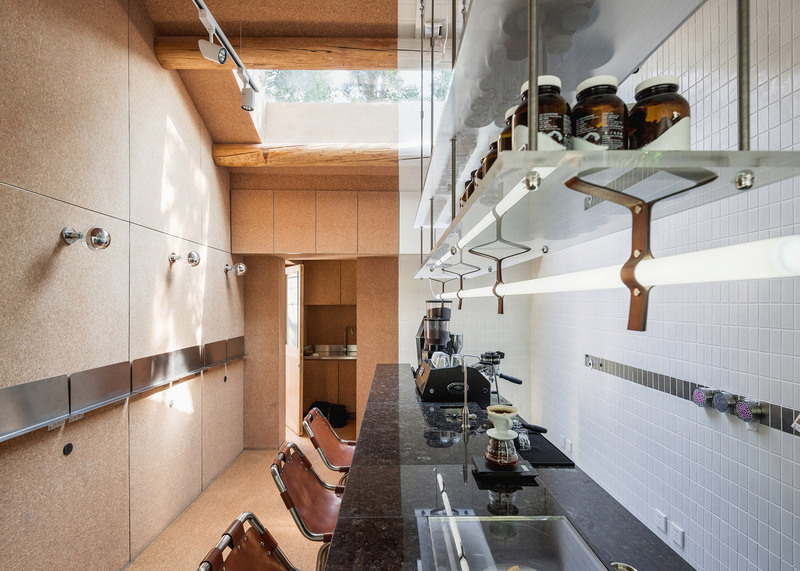 A light tube hangs below the shelves on four leather straps. Leather bar stools are lined up along the edge of the bar, while a row of metal flaps to their rear fold down from the cork-covered wall to offer a cup-rest for patrons only having a quick coffee. Corks doors open into the back-of-house washing area and toilet, and the entrance to the guest room set on the other side of the shared courtyard. Previously occupied by the landlord and her son before he left for college, the architects extended the tiny space and refreshed the interior with a layer of straw clay, walnut flooring and joinery. 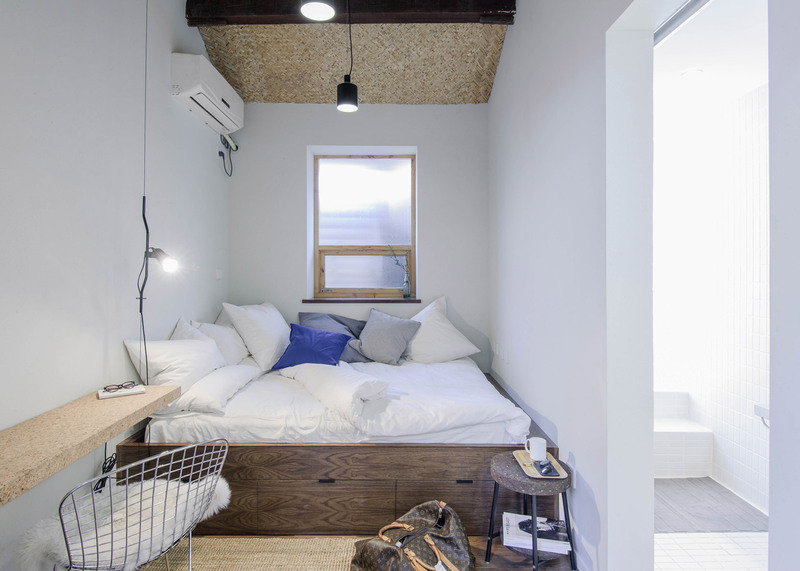 The built-in double bed has storage room beneath it for extra bedding and luggage, and a simple cantilevered cork desk doubles as a bedside table. "The interior is furnished sparsely to fulfil the basic needs of a B&B," they said. 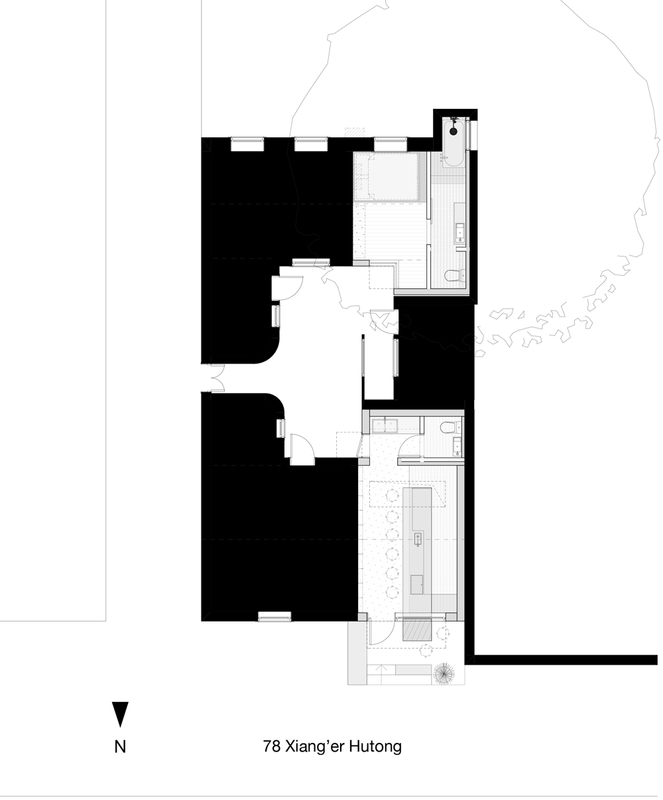 "The result is reminiscent of a traditional hutong dwelling interior." 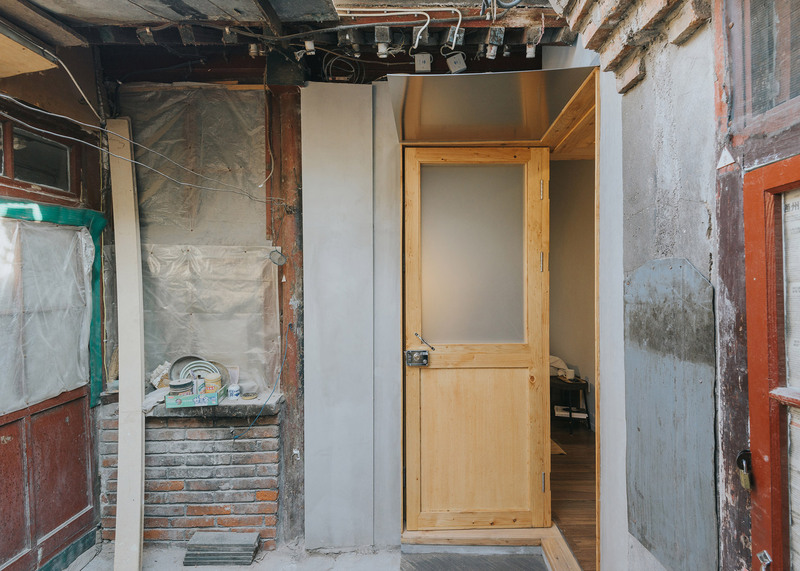 Many of the traditional hutong neighbourhoods are being redeveloped to create contemporary housing and businesses. 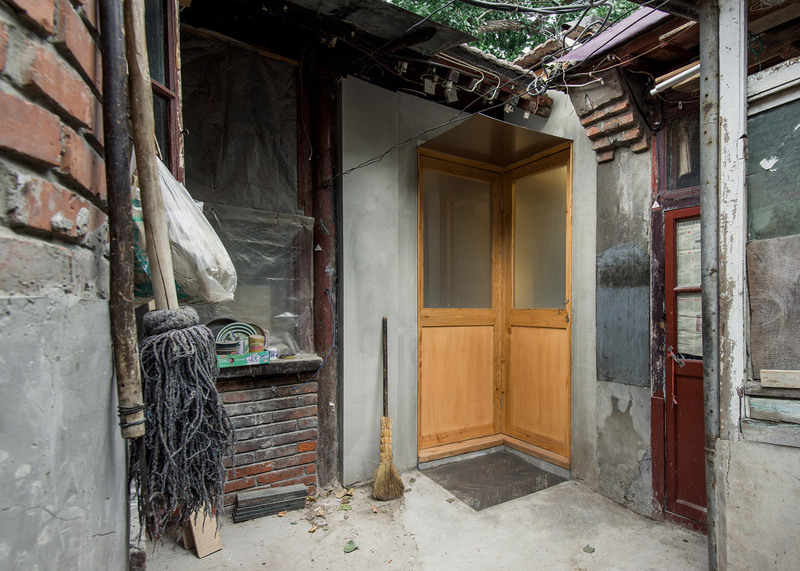 Previous hutong redevelopments in Beijing include a series of bubble-shaped extensions designed by local firm MAD to improve living conditions while preserving the vernacular urban fabric, and a teahouse with curving glass courtyards by Chinese firm Arch Studio. Photography is by Eric Zhang and Yu Cheng.